Motivating your children to explore the great outdoors. Summertime offers wonderful opportunities to play outside with your children, helping to develop common interests and a healthy family bond. In the deep grass, on the beach or in the neighborhood garden, your senses will bloom. You can even use indoor activities to expand on your outdoor discoveries. Drawing scenes of the landscape, creating music about Mother Earth and discussing the wonders of nature at home often make the excitement of getting outside even greater. And both indoor and outdoor activities offer creative, physical and emotional benefits for your children. Here are some ways to complement outdoor discoveries with indoor activities. Explore the backyard then write down what you saw. Talk to your children about the seeds and plants you intend to grow in the garden. On a piece of paper, list the seeds and plants to purchase from a landscaping store or farmer’s market. Families in urban areas may want to grow the produce and plants indoors. When outside, observe the birds, squirrels, rabbits, insects and plants you see. Encourage your children to make a list, separating the plants and animals encountered, and later even the species. For example, if you live in a nature-rich area, you could make a long list of birds you’ve seen. You can then break it down even further into characteristics of each bird. The same is true of different kinds of flowers and vegetables. 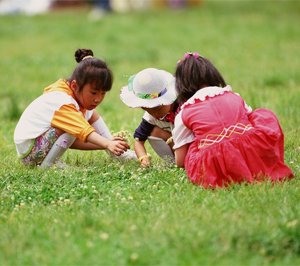 Your children will yearn to get back in the yard to make more discoveries firsthand. Regularly visit and recreate a favorite place in nature. Draw or paint on poster board with your children an image evoking a favorite place in nature. Give the artwork a title with the name of that place. Tack the poster somewhere like on your refrigerator, where you and your children may see and talk about the piece of art. Your children’s curiosity will grow each time they look at the poster. Return to the natural setting to pinpoint new observations. Entice your children to expand their discoveries of the special place. Recommend that they look for flower growth, moss, branches, streams, animal holes and other findings. In your conversations and drawings about nature back at home, your kids can creatively portray what they have seen. Make up melodies and songs along the nature trail and at home. You and your children can celebrate your outings in nature with song. Surroundings may inspire your children to create a melody and accompanying lyrics. Perhaps get the kids started on a musical journey and let them take it from there. When you return home, write down the songs and continue singing along with your kids, so the melody becomes ingrained in your mind. When you sing at home, you’ll feel the magic of the spot in nature that inspired the particular song. And when you return to that place in nature, expand on the song. It may even entice you and your kids to dance. Enjoy outdoor sports activities. Climbing, running, skipping, jumping and swimming in nature help to keep you and your children in good shape. At the same time, you take in fresh air and beautiful surroundings. But even the most avid hikers and swimmers don’t always have the chance to get outside and experience the natural world. Staying fit in nature can be complemented by a trip to the town swimming pool, a pit stop at an indoor climbing wall or a session on homemade sports terrain in your living room. Set up a station for jumping rope, dancing to music or having an active laugh together in closed quarters. You will be making fitness a priority and an opportunity for quality family time— and the family should appreciate the vastness of the outdoors even more on the next excursion outside. Most of all, while staying fit, you are strengthening the family bond.